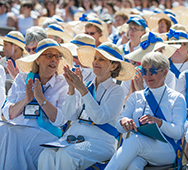 In collaboration with the Friends of Smith College, we are pleased to offer many opportunities to experience the vibrant life of the college through family-friendly and informative programming. Saturday afternoon, noon – 3:00 p.m. The Friends of Smith College welcomes families and visitors of all ages. Athletics, the Botanic Garden, the Libraries, and the Museum of Art—all of these incredible resources make Smith unique. Visit us during Reunion to enjoy a botanical paradise under glass, take a boat out on Paradise Pond, view rare books, manuscripts and Smith memorabilia, or analyze the details of a work of art from just a few feet away. Please check the printed Reunion program for time and locations.